The yard sales were slim pickings over the Memorial Day weekend. Incredibly, I only found one to go to. The Craigslist ad was enticing though, talking about a lifetime of treasures from a "neat-nick" mom who was moving south. The description caught my interest, particularly the idea of a "neat-nick" who was moving. The Craigslist ad had a brief list of things up for sale, but I wondered what other good stuff Mrs. Neat-nick might be selling? I often ask myself this question and can tell you from experience....there is a way to find out. 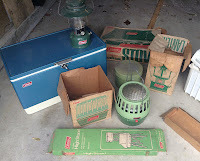 With the help of Google and other Internet sources, you can sometimes identify stuff to be sold at a garage sale before ever showing up in the driveway. While some folks might call it cyber stalking, I call it just doing your homework! Take for example the Neat-nick mom who's CL ad stated she was moving. Typing her home address into the Google search bar turned up a link to her home's real estate listing. Clicking on the listing, I found numerous photos of the exterior and more importantly, the interior of the house. From there I could check out how she decorates her home and the quality of her furnishings. As I clicked through the photos, I could tell she really was a "Neat-nick" with some pretty nice stuff in her house! I continued to page through real estate photos, picking out items I hoped she'd be selling at her garage sale. One was some camping gear I spotted in a picture of the garage. Kind of creepy but hey, that's the age of the Internet for you! With my internet research complete, I arrived at Mrs. Neat-nick's sale at the 8:00 AM start time. I was greeted with a crowded street of fellow yard salers. Normally you don't see that kind of congestion at one sale, but clearly the lack of any additions sales drove everyone to Neatnik's house. The street was crowded, but I pulled the truckster into a safe spot and hustled up the driveway. The first thing I spotted was the Coleman camping equipment I'd seen in the garage picture. 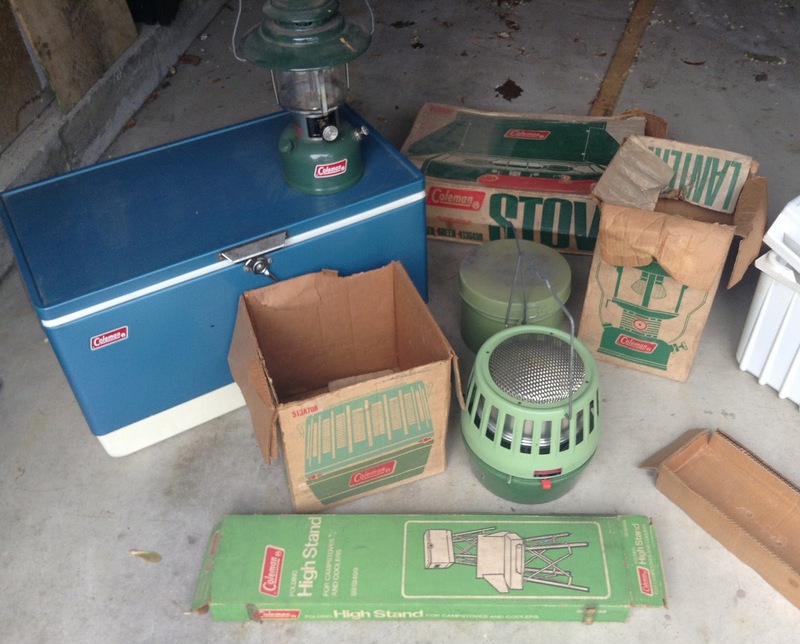 It included a camp stove, lantern, heater and pots, dishes and clever folding legs used to support a stove or cooler. All this for under $30! Neatnik's husband was assisting in the sale, so I asked him how much for camping gear? Mr. Neat-nick quoted me a price of $25 for everything. If you've read my previous blogs on Coleman camping gear, you know the stuff can fetch nice money on eBay! Knowing that, I really couldn't argue with Mr. Neat-nick's price. But naturally I still countered with $20 anyway and Mr. Neat-nick accepted without a blinking an eye. (That's the great thing about people who are moving-they usually don't care about making a ton of money on their stuff. They just want it sold.) I slipped Mr. Neat-nick a twenty dollar bill and continued to look around his driveway. I then turned my attention to a vintage Coleman cooler sitting on the opposite side of the driveway. Old steel Coleman coolers can sell for huge bucks on eBay. One in near pristine condition just sold on eBay for $200 dollars! How crazy is that, right? 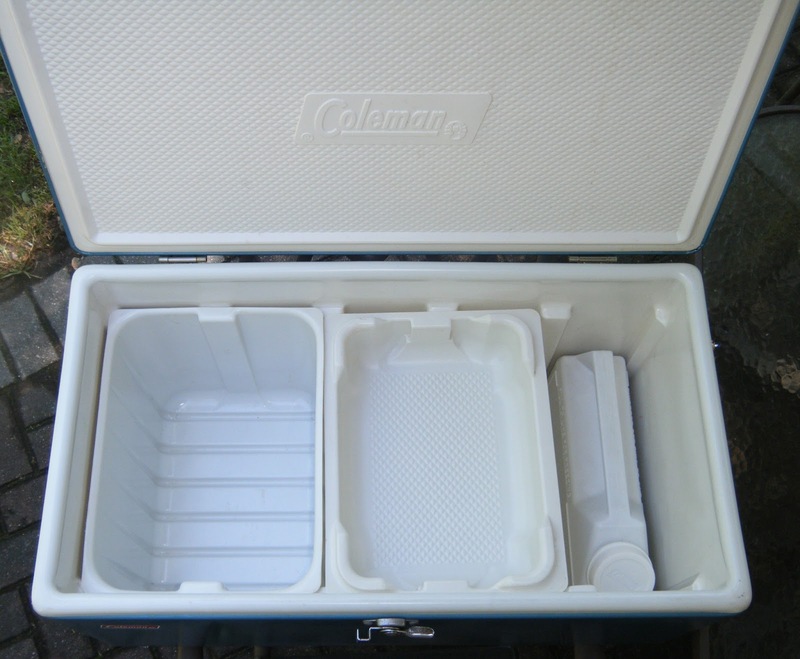 If you grew up during the Sixties or Seventies, you probably saw a Coleman cooler at every summer picnic! Many didn't survive, rusting out and eventually being replaced with boring plastic coolers. (Some of which now sell for decent money too.) So once I spotted this rare "Ice Blue" Coleman cooler, I pretty much made up my mind it was coming home with me. Although a little dusty, it was still in great condition and looked like it would clean up nicely. Moving in for the kill, I asked Mr. Neat-nick how much he wanted for the big cooler? He looked over at me and responded in the form of a question, "Ummm, how about ten bucks?" Now I'll admit ten bucks is a pretty good price, but like any good garage sale picker, I am not taking the first quote. I opened up the cooler and mentioned to him that the plastic tray was missing. With this flaw now pointed out, I hit him with my counter offer of five dollars. Chuckling that I'd "got him" on the missing tray, he agreed to accept five bills for the cooler. But he added a "rider" to the agreement-if he could find the original tray the price would go up to eight dollars. All three trays still here! That deal was fine by me. I knew having the original tray would only add to the cooler's value. Mr. Neat-nick then went inside his house and began the search. After only about five minutes he came back out with not only the tray, but the original water container and the deep bin! With those awesome additions to the cooler, I gladly forked over another three dollars. It worked out to one dollar for each additional piece-a no-brainer and great price! I left the sale spending a total of $28 dollars for Coleman gear that could potentially sell for several hundred bucks. Not too bad considering it was the only sale of the morning! Once home, I had some cooler cleaning to do. 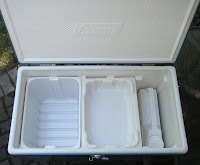 With a Memorial Day picnic scheduled at my house, I decided my Ice Blue Coleman cooler was going to have it's official coming out party. On the day before the party I lovingly washed the cooler and trays down using a combination of car wash soap and dish washing liquid. After rinsing the soap off the cooler, I stepped back to admire my work. It turned out beautiful! So nice in fact, that I took over a dozen photographs of the cooler for the blog, as well as any future eBay auction. On the morning of the picnic, I loaded the cooler with 40 pounds of ice, along with mass quantities of soda, water, wine coolers and beer. As an added touch, I decided to position the cooler on the sturdy Coleman Stove folding legs also bought at the garage sale. Looking spectacular on it's Coleman legs, the big cooler was center of attention at the picnic! Adding to the hype, I continual pestered family members, proudly asking what they thought of my new cooler? Everyone agreed it was awesome and most added I'd be nuts to sell it! Despite my growing attachment to the cooler, I haven't decided whether I am posting it on eBay or keeping it. Given it's excellent condition, I am certain it could sell for a ton of money and would probably rival the $200 Coleman cooler auction mentioned above. For now, it's drying out in the garage. But I can't lie....it has a very good chance of seeing many more picnics in my backyard! This summer make sure you look for vintage Coleman coolers at the garage sales. Great for eBay flipping or your family picnics!